has 2L/1.6cm or 3L/2.4cm lengths. The solution was a note in the inventory. Does the new catmin SC now think anything can be done? Add this to the list? parts are in the catalog. Does the new catmin SC now think anything can be done? Yes, and nothing has changed. with photos so that they can be approved and added to the appropriate set inventories. 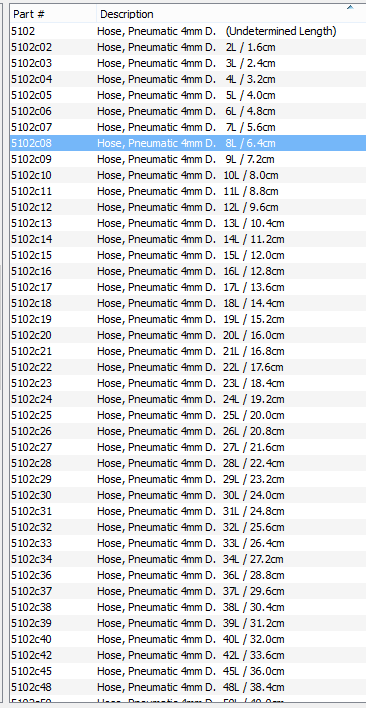 I do not own these pneumatic hoses and therefore cannot add them to the catalog. them to the catalog and then inventories. left for catmins to figure out? Parts: Hose, Pneumatic 4mm D.
mentioning that this is a more significant issue that I realized.